The new Republican health care bill hurts only the old, sick, and poor. No prob. Some of my favorite posts, or at least my favorite posts, have been those i described as Language Moments, all so far involving my own experiences. One that i haven’t written about involved Gary’s girlfriend, who was the daughter of Hungarian Jews who’d immigrated to this country in the aftermath of WWII. Although she was born in San Francisco, her first language was her parents’ Hungarian, but of course she learned English from playmates even before she started to school. However, she continued to speak only Hungarian with her mother. Then, shortly after her mother’s death, she decided to visit Hungary to get in touch with her roots. Alas, the moment she stepped off the plane in Hungary, there was a great shock. In spite of what she thought of as her fluent Hungarian, she had great difficulty communicating with the Hungarians because her vocabulary was woefully deficient. The problem was that she and her mother had talked only about household matters, so she didn’t know the words for many of the most elementary aspects of travel. Things like “bus stop”, “park bench”, or “tour guide”, and she had to talk around these words in elaborate circumlocutions. And it was even worse when she visited historical sites and discovered that the only way she could really understand any commentary was to hang around on the fringes of tours conducted in English. She returned thoroughly traumatized and ruefully remarked that her visit was mostly a crash course in Hungarian. Well, i had lunch yesterday with my friend Ian, and he told me a delightful story about another child of Holocaust survivors, Poles who’d immigrated to a small town in Canada where there were no other Poles. The parents had been so thoroughly traumatized that, even though their daughter’s first language was the Yiddish they were speaking at home, they told her it was Polish. So it came as a great shock to her when, in her late teens she visited New York and went to a Polish neighborhood only to discover that she couldn’t understand a word they were saying, nor could they understand her. And then, in another neighborhood, she walked into a sandwich shop where the people were not speaking English, but joy of joys, she could understand them perfectly. Yep, a Jewish delicatessen. And that’s how she discovered she was a Jew. 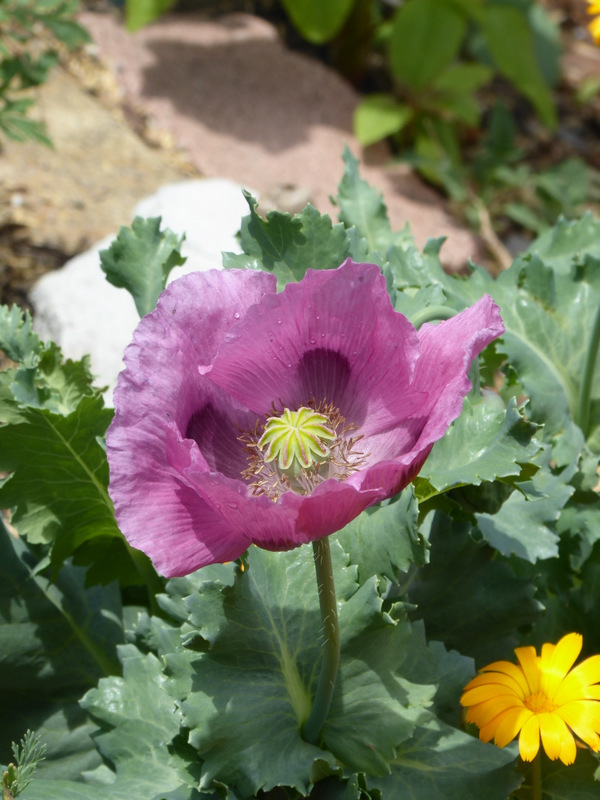 Meanwhile, an opiate in Petaluma, Papaver somniferum.